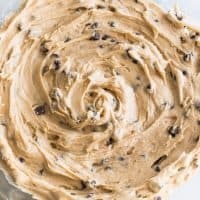 This Small-batch Cookie Dough Frosting tastes just like an extra creamy batch of cookie dough that you happen to get to spread over a cupcake. If you’ve ever made chocolate chip cookies and been tempted to just eat the dough by the spoonful instead of baking it, this is the frosting for you. Hey, friends, I have another small-batch frosting recipe for you today. I started sharing these frosting recipes alongside my small-batch cupcakes back in August because I wanted you guys to be able to mix and match small-batch cupcakes and frostings to make whatever kinds of cupcake creations you were craving. And today, we have Small-batch Cookie Dough Frosting! I used this a couple months ago on these Chocolate Cookie Dough Cupcakes, but today I’m sharing just the frosting as a stand-alone recipe. And if you haven’t tried it yet, this frosting is crazy good. If you’ve ever made chocolate chip cookies (these Small-batch Chocolate Chip Cookies perhaps?) and been tempted to just eat the dough by the spoonful instead of baking it, this is the frosting for you. 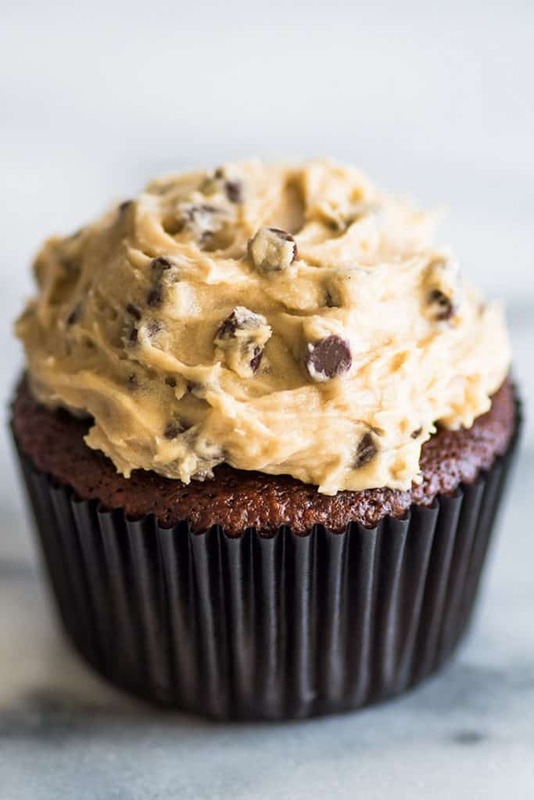 It tastes just like an extra creamy batch of cookie dough that you happen to get to spread over a cupcake. And I mean, that’s the dream, right? 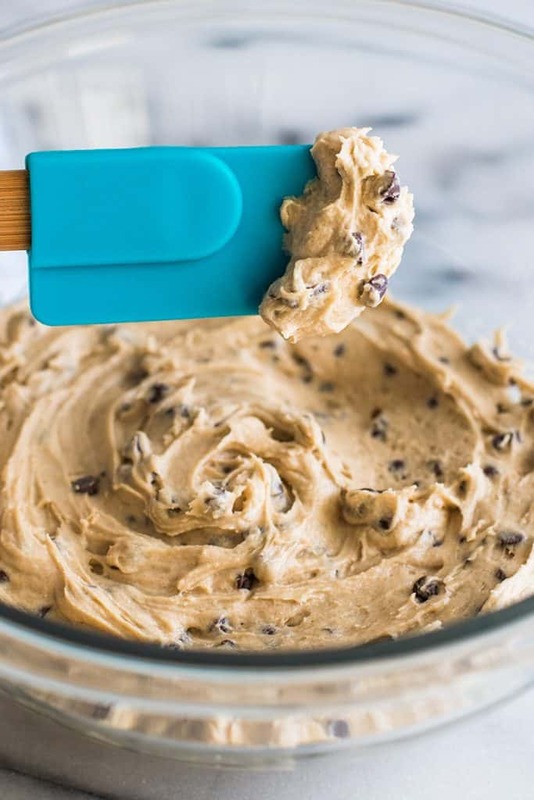 The reason this Cookie Dough Frosting tastes like cookie dough because it is essentially cookie dough, minus the eggs and leaveners and with slightly different ingredient ratios. It’s even made the same way. Just like with cookie dough, you start by creaming softened butter and brown sugar, adding vanilla, and then beating in the flour and salt. 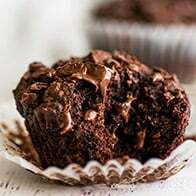 But then instead of putting that mixture into the oven, you drizzle in some milk or cream and beat the frosting until it is light and fluffy before folding in lots of chocolate chips. If you’re reading this thinking that flour seems like an odd ingredient for frosting, 1) it’s actually really important to the flavor. Part of the cookie dough taste is the flour taste. You might not think of flour as tasting like anything, but it absolutely does. And 2) flour is used in frosting all the time. There’s actually an entire category of frosting called Flour Buttercream or Ermine Frosting made with flour, so it’s way less strange than you might think. And while we’re on the topic of flour, before I get lots of angry comments or emails about uncooked flour in this recipe, don’t worry. I’ve got you covered. 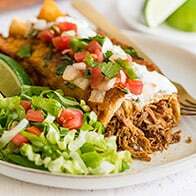 As with under-cooked eggs, consuming raw flour does run the very slight risk of food poisoning, so if you’re concerned about that, you can absolutely cook your flour before adding it to your frosting. 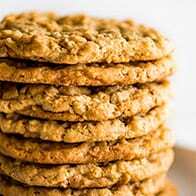 I do find that cooking the flour removes the raw flour taste which is part of the cookie dough flavor (I know, who knew there were so many facets to the taste of flour), but your frosting will still be excellent. To cook your flour, simply line a baking sheet with parchment paper and spread your flour out over the top. Bake at 350°F for 10 minutes and then allow the flour to cool completely. Baked flour has a tendency to clump together, so you’ll need to sift it to get rid of any lumps, but after that, you’re just a few minutes and a few ingredients from the Cookie Dough Frosting of your dreams. Properly softened butter is a MUST for the frosting recipe. If your butter is not soft enough, the ingredients will not mix completely and you will end up with little flour lumps in your frosting. You want butter that is not melted but soft enough to easily squish with a finger. This shouldn’t be a problem during the summer, but in cold kitchens during the winter, you might need to cut the butter into cubes and place somewhere warm for a couple minutes. Finally, I recommend using a handheld electric mixer for the frosting. Small-batch frostings can usually be made by hand in a pinch, but I suspect you’ll have a hard time getting the flour to mix completely in this recipe if doing it by hand. Looking for more small-batch frostings, try my Vanilla Frosting, Chocolate Frosting, and Cream Cheese Frosting. 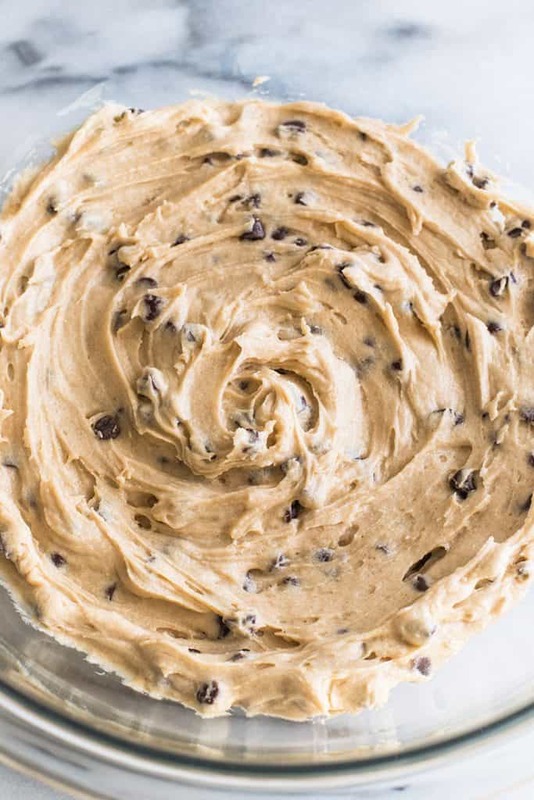 This Small-batch Cookie Dough Frosting tastes just like an extra creamy batch of cookie dough that you happen to get to spread over a cupcake. If you've ever made chocolate chip cookies and been tempted to just eat the dough by the spoonful instead of baking it, this is the frosting for you. Preheat your oven to 350°F and line a baking sheet with parchment paper. Sprinkle flour over the parchment paper and bake for 10 minutes. Cool completely. In a medium bowl, use a handheld electric mixer to cream well-softened butter and brown sugar until light and fluffy, 1 to 2 minutes. Add vanilla and beat until well-combined. Sift flour and salt over the top, and with your mixer on medium, mix until flour is completely mixed in, 1 to 2 minutes. The frosting will look like course crumbs. 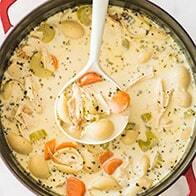 Add 2 tablespoons of the milk and beat, starting on low working up to high until frosting is smooth and fluffy. If frosting is too stiff, add milk by the 1/2 teaspoon until the frosting reaches your desired consistency. Use frosting to frost cupcakes, brownies, or cookies, and enjoy! *Correct flour measurement is very important in this recipe. For best results, measure by weight or the Spoon and Sweep Method (stir the flour in your container to fluff it up and then spoon it into your measuring cup, sweep excess off with the flat of a knife). I want to eat this whole small batch. Cookie dough is my weakness. 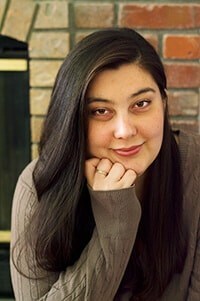 Hi, Alicia, so sorry you guys didn’t enjoy the frosting! You probably didn’t do anything wrong. Unless the flour was burned, you might just not like the taste of cooked flour. I shared one of these with someone recently who had a similar reaction to the cooked flour taste. If you want to try them again and aren’t concerned about raw flour, you can skip the flour baking step. The flour taste is still prominent, but prominent in the same way it is when you eat a spoonful of cookie dough. Yes. If you feel comfortable eating cookie dough, you can skip the oven step. 😉 It’s just there for people who are concerned about consuming raw flour.